Need assistance on doing business in Asia? Need help with your Publication Store orders? Want to leave a comment or question? Sara` Palermo il nuovo porto della Via Della Seta? Are American Manufacturers Really Exiting China? Demonetization in India: Masterstroke or Gross Miscalculation? 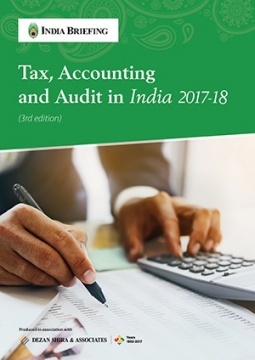 The third edition of Tax, Accounting and Audit in India is updated for 2017, and provides an overview of the fundamentals of India’s tax, accounting, and audit regime, including the major tax, legal, and regulatory obligations foreign investors are likely to encounter when establishing or operating a business in the country. This edition of the guide also includes a detailed introduction of the Goods and Services Tax (GST) that was launched on July 1, 2017, representing the complete transformation of India’s indirect taxation structure. This concise and comprehensive guide is ideal for tax specialists, CFOs, compliance officers, and heads of accounting who must navigate India’s complex tax and accounting landscape in order to effectively manage and strategically plan their India operations. Taxation permeates business transactions in India, and a strong understanding of tax liabilities can enable foreign investors to maximize the tax efficiency of their investments while ensuring full compliance with all tax laws and regulations. This guide was created in 2017 based on the most current information available at the time, and provides an overview of taxes for businesses and individuals in India, and discusses accounting and audit practices in the country. Making a strategic and informed decision about investing in India requires a thorough understanding of the diverse options for investment in the country, in addition to the regulatory structures that govern operations and compliance. This tax guide discusses some of these regulatory and legal structures, and can be used as a guidebook for companies and investors seeking to operate a business in India. As the tax situation of each enterprise is unique, and India’s regulatory environment is subject to change, it is advisable that firms and investors seek professional tax advice. India Briefing’s “Tax, Accounting and Audit in India” is produced in collaboration with the tax experts at Dezan Shira & Associates, a specialist foreign direct investment practice providing corporate establishment, business advisory, tax advisory and compliance, accounting, payroll, due diligence, and financial review services to multinationals investing in emerging Asia. ©1992-2019 Dezan Shira & Associates All Rights Reserved.